Struggling phone manufacturer RIM may be about to lose a very high profile BlackBerry customer: the President of the United States. As reported by the Wall Street Journal, the White House Communications Agency (WHCA) is vetting a number of Android smartphones from Samsung and LG Electronics for internal use. 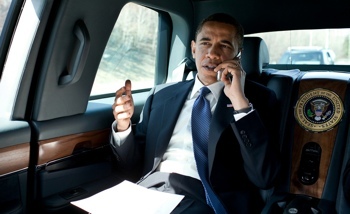 Currently, the president uses a modified BlackBerry. No firm decision has been made to switch platforms. When it comes to the leader of the free world, switching from one phone to another is a lot more complicated than just walking into a Verizon store. The president’s communications need to be secure. So, before the White House can use a new phone, the Department of Defense (via the WHCA) needs to perform extensive security research and testing. No specific phones were mentioned in the report, and any switch is still "months away." Still, if you’re listening, Mr. President, Techlicious has a few phones perfect for making the switch to Android. The soon-to-be-released Samsung Galaxy S5 is waterproof (IP67) and has a great new camera to improve those Oval Office selfies. If you’re really looking to keep deficits down, check out LG’s Google-branded Nexus 5 instead – the impressive device is just $349 off-contract.